Molex Micro-Fit is a unique connector precisely built for larger power connections. 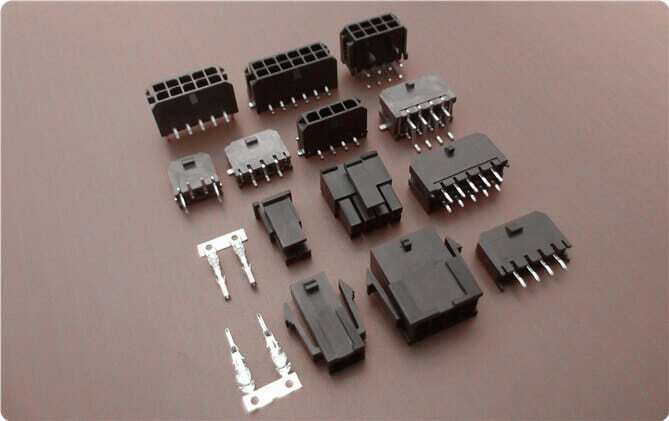 Unlike the other connectors, Micro-Fit is rarely used in consumer electronics, but rather, on more complex systems in which its small size and high current capacity is highly benefited. Delivers a current rating up to 5.5 A for American Wire Gage (AWG) #20 - #30. They are designed for blind-mating applications available in 2-24 circuit sizes for single and dual row applications such as computer motherboards, automotive PC power supply, HP printers and Cisco routers. Utilizing Terminal Protection Assurance(TPA) Technology, Scondar manufactures Molex Micro Fit 3.0mm with enhancements in its connector housing and contact design to help prevent connection failure. TPA designs offer overlooked connection solution by providing locking redundancy. This promotes durable connector design in which terminals can be inserted properly without degradation from unnecessarily exhausting them with thousands of insertions. Reduced Mating Force (RMF) solutions are also achieved in Scondar’s Micro Fit designs with lower friction force between the contacts of the device and the socket, making insertion and removal of the device easier, while at the same time eliminating the need for the complex mechanisms such as in ZIF sockets. Micro-Fit 3.0 BMI Connectors have blind mated connections, differentiated from other types of connectors by the mating action that happens through a sliding or snapping action which can be accomplished without wrenches or other tools. Surface Mount (SMT) and Press Fit (PFT) both meet different needs for a broad range of electrical/electronic circuits. Press Fit Technology is often used in big connections with a reflow soldering process. Surface mounting technology (SMT) is a state of the art soldering process step applying numerous electronic components to a PCB. While SMT option is common and widely used in electronic systems, SMT has certain limitations over PFT depending on application. Scondar can offer PFT or SMT option to meet your application need. Scondar’s 3.0 mm Molex Micro Fit can be used for AC and DC operations with a rated current of 5.5 amperes and 250 Volts. It is applicable in both chassis wiring and power transmission wiring. There’s a dimple at the center of the contact which ensures positive contact and low contact resistance at all times. Insulation resistance and contact resistance are of 1000 Mega ohm per minute minimum and 10 Mega ohm maximum, respectively. The temperature range for this connector is -40 degrees centigrade to +80 degrees centigrade. This range is based on the rise of temperature with increasing current. One of the strongest advantage of the Micro Fit series is its applicability in delivering the high current requirement in electronics with supplying high power. Scondar’s Micro Fit connectors ensure safety, system protection and performance with its bonded metallic conduits and multiple grounding points preventing fire hazards, component damage, overheating and possible electrocution. The Motherboard of a computer holds together many of the crucial components such as the central processing unit (CPU), memory and connectors for input and output devices. Microfit connectors ensure high performance electronic system in quality motherboards. You can easily find Scondar’s Microfit in most ITX Motherboards, in which its functionality is best described for solid performance in a small footprint, and low power consumption (less than 100 Watts). Smart, high power automotive PC power supply garners its capabilities from quality Microfit connectors, designed for general purpose battery powered applications. These are manufactured to provide power and to control the motherboards' switch based on ignition status. Microfit can also be commonly found in a solar array. A solar array is connected to each other, and to inverters through connectors to produce a successful flow of electricity.